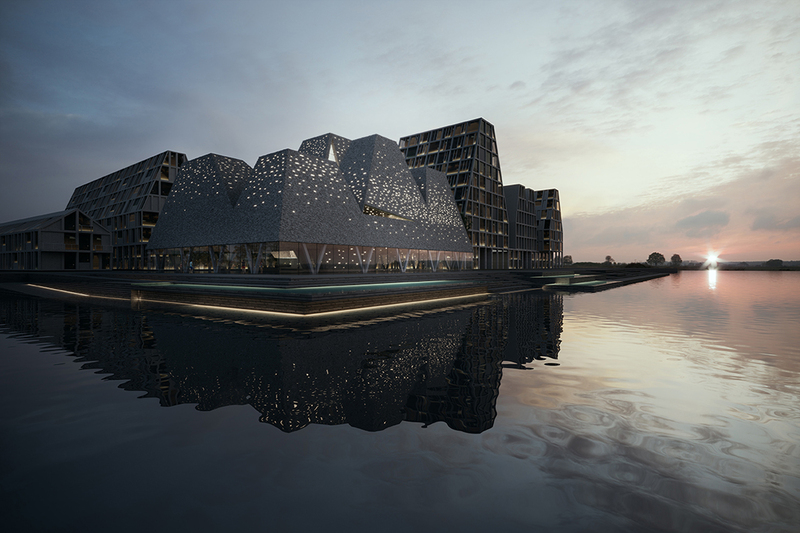 The new Waterfront Cultural Center with Harbor baths at Paper Island is to highlight the significance of water in the history, culture and vibrant urban life in Copenhagen. The harbor is the gate contributed greatly to the city’s development. 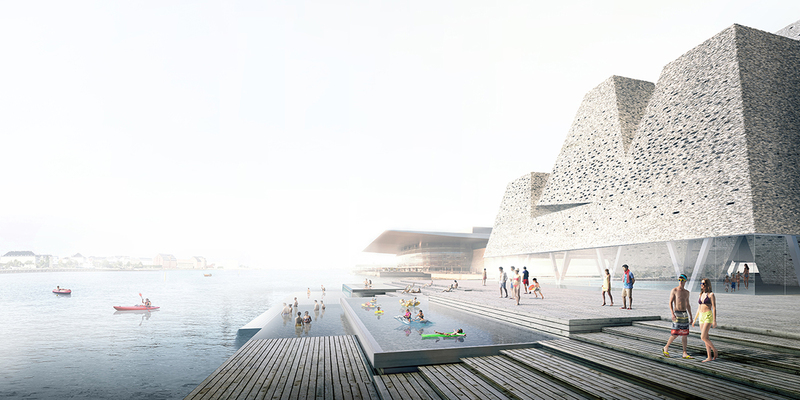 Waterfront has become the foreground and the background for major cultural facilities and the quality open public area that defines the urban life in the city. Our focus in design is to create an experience, and not just a standalone object, in the form of the landscape, art and architecture that are unified and defined by the water. 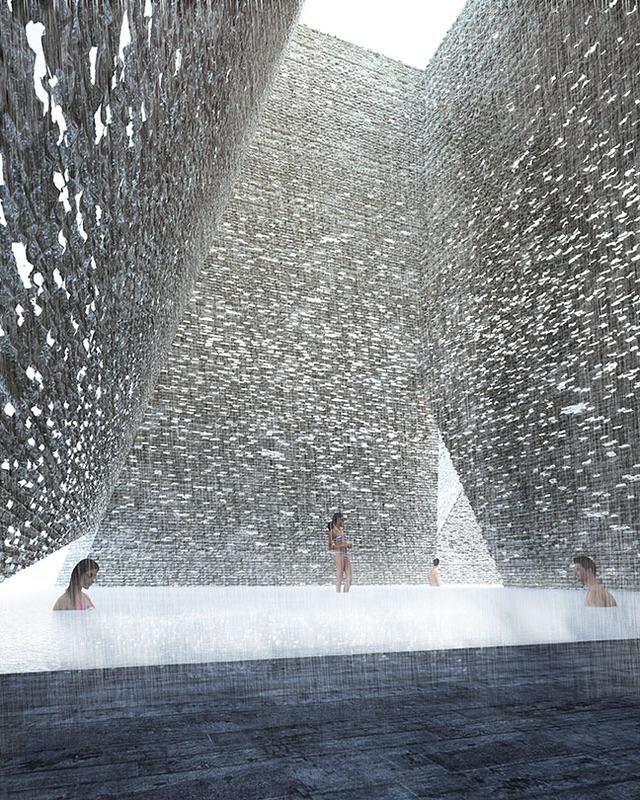 Our design proposal strives to offer the diverse experiences of water in various states and conditions such as reflection of light and shadow, steam and flow that appeal to human senses. 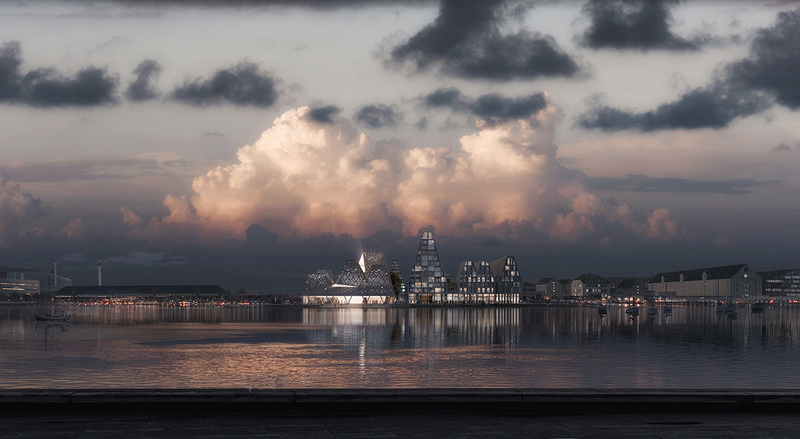 The project takes place in the larger development plan of the island. 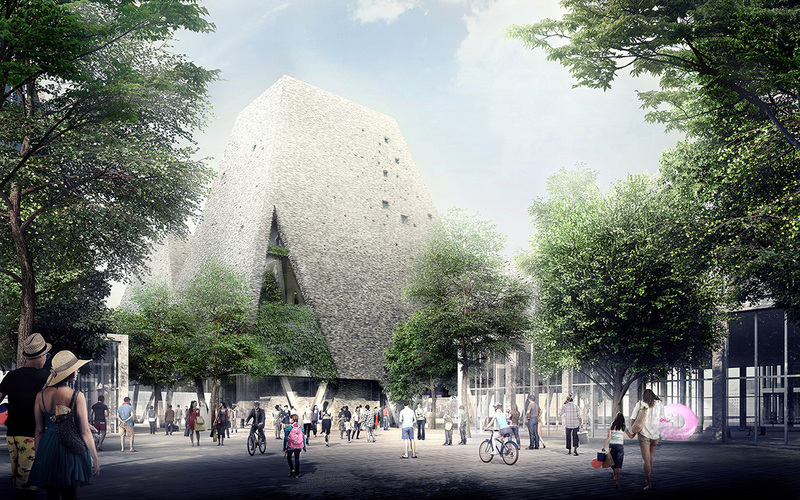 Its architectural form in a series of pyramid shape is in response to the masterplan guideline to work with roof profile of Christiansholm but at the same time it expresses its unique identity. What is distinctive from the rest of the masterplan building is that the architecture does not have a single front, but it is multi directional to be easily recognized and accessible from various directions. It is to offer spontaneous, open and tangible place that carries the memory of vibrant and dynamic nature of the present Paper Island. 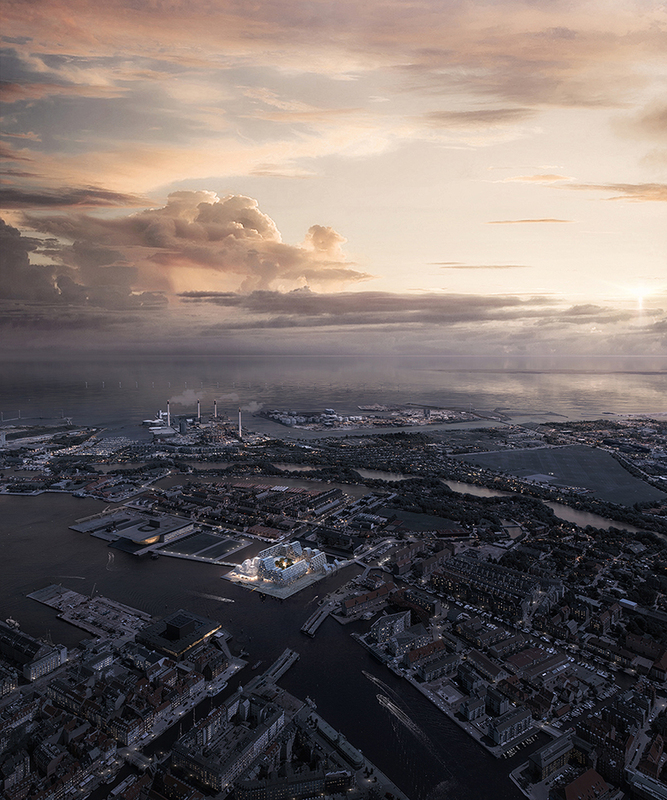 Taking advantage of the prominent corner site of the project defined in the masterplan, the ground floor plane of the indoor to outdoor and to the sea is designed in a single gesture. 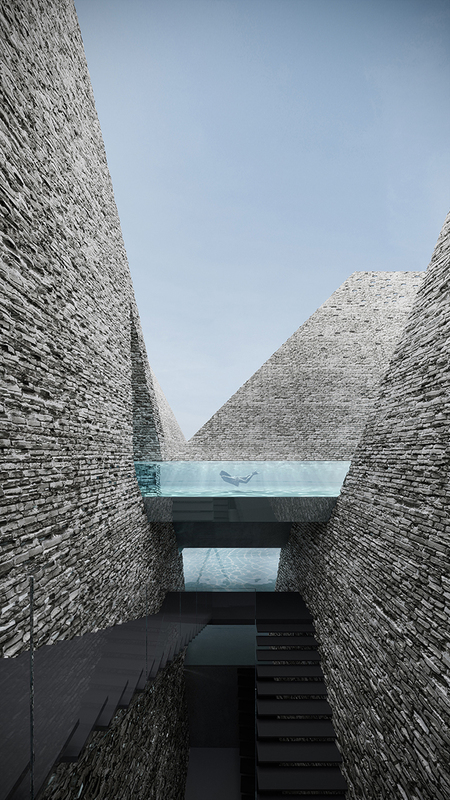 Landscaping the ground plane in terracing and cascading manner creates expansive, continuous perception of water surface from indoor all the way to the harbor. 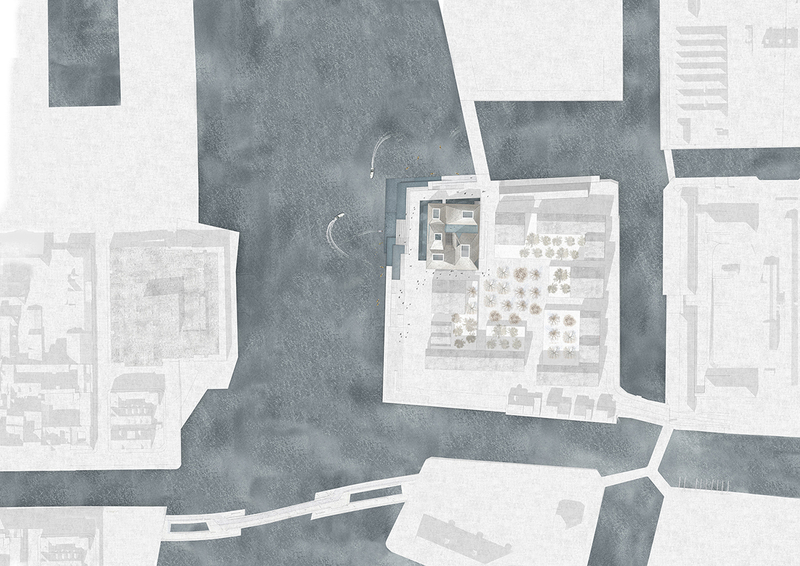 Our design attempts to soften and dissolve the edge and blur the sense of boundary of the land. Our strategy of generating the architectural space structure and the form is to manipulate the composition of positive and negative volumes. A series of cone shape volumes in various proportion are generated by being pushed and pulled vertically and horizontally to create particular experiences for each program. 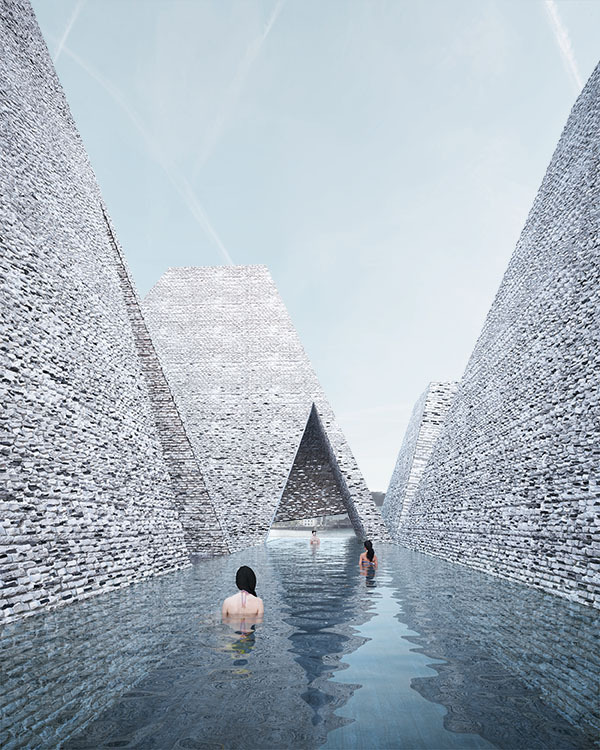 The cone shape roofs extruded above correspond to the division of pools at the ground floor. 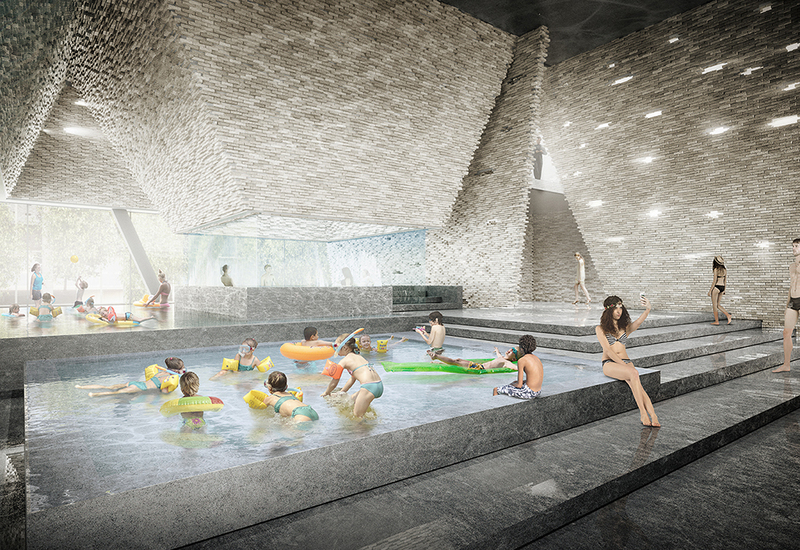 Each pool has distinctive space in the almost exaggerated scale with concentrated light and shadow through large skylights above. The level above the ground floor is defined as the “negatives” of these extruded roof volumes. It is an open air pool and hot bath that one would experience swimming and dipped in the “valley” among the architectural hills. The inverted cone in the central position works as structural core. It is the deepest void, “valley” among these roofs where outdoor stairwell is placed. Brick is chosen to relate to the context of the area and to highlight the quality and aesthetic of the traditional Danish craft. Its haptic texture and warm natural earthy color tones of masonry would achieve the tangible skin defining interior and exterior. In our proposal we are exploring the potential of brick in its small scale texture being expressed in the large scale of the architecture. Its small units allows us to play with various openings and tectonics, screening natural lights and shadow that reflects on the water surface.